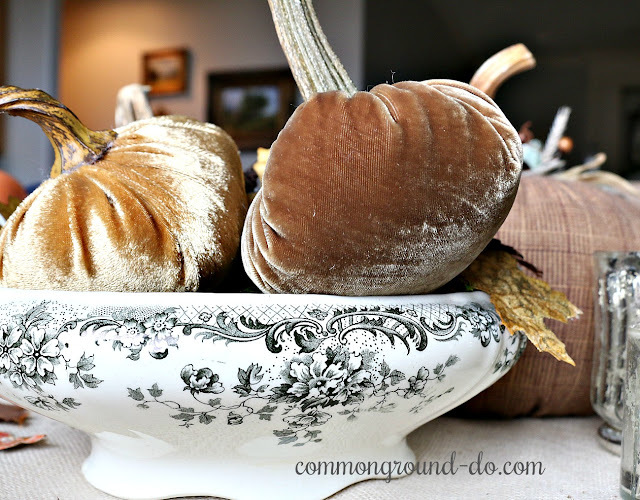 Even though we're working on the new house with it pretty much in disarray and a lot going on, I still have that need to scatter a little Fall Decor about. 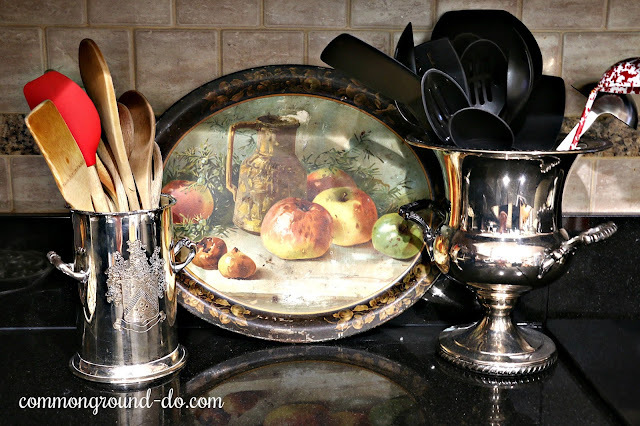 During August and September I was able to get a jump on some packing, especially some of my decor pieces like old dishes and vintage odds and ends. I found a few things that I don't think I'd shared on the blog for awhile so I thought I'd try to use a few of them for the season. 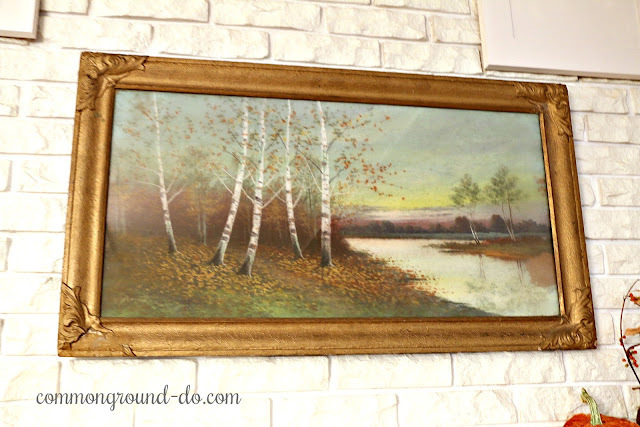 In my large office/study at our previous home, I had this old print in it's original frame. River Birch is my favorite tree, along with Maples, but the beautiful white bark on the Birches just fascinates me. I hadn't had a spot for it at our current home, so it was still wrapped in plastic sitting in the storage room in our current basement. I had Hubbs hang it on some existing nails in the mortar of the brick fireplace at the new place. 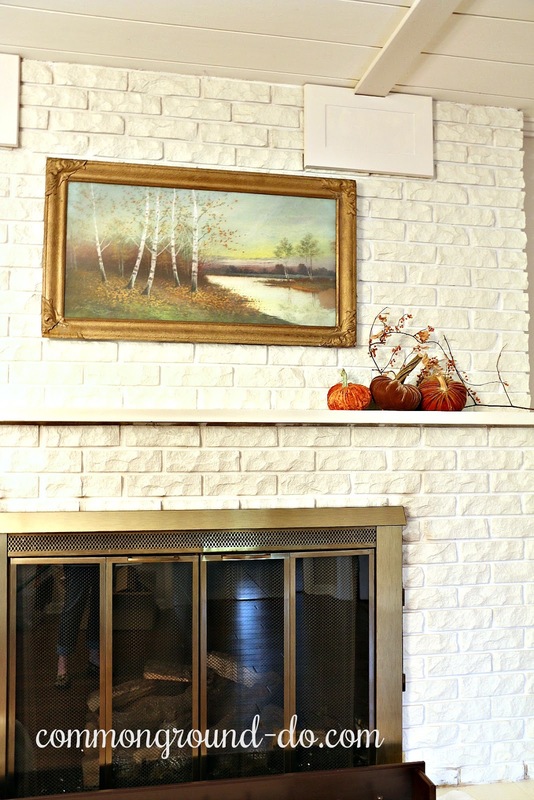 We need to repaint the white fireplace since it had been used with firewood, but now has a gas line in place. A few little velvet pumpkins and Bittersweet followed. I had a stash of silver pieces that hadn't been cleaned in over 5 years, so needless to say these were horribly black and tarnished. A little elbow grease brought out the shine and I'm using them here in the kitchen for utensils. One of the first things I did was pack up my china cabinets, so most of the Transferware is in boxes. I had some extra pieces stored away in the bar area of the basement and I didn't really remember everything that was stored there. While packing, I found this little lid-less vegetable dish in a dark green/almost black transferware pattern. (Burslem Pottery England) It's so "almost black" I thought it would look perfect with some Fall pumpkins and naturals. 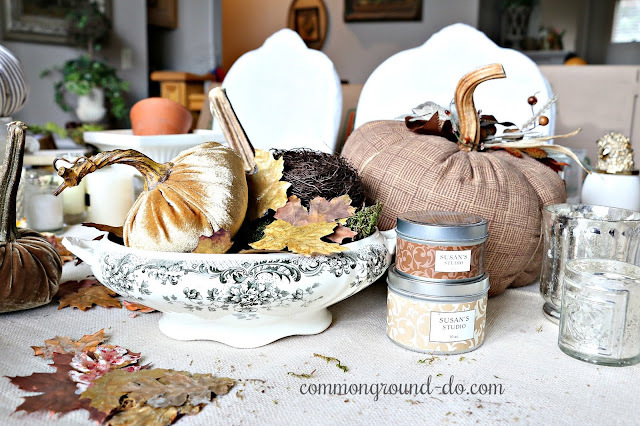 Votives and other small candles are out waiting to be boxed up, so I did an impromptu shot of a few Fall goodies. It's a little messy here on the Dining Room table, but I think some moss and leaves work for the Autumn ambiance. We've been painting the new house the last 2 weekends and are making some progress. First were the ceilings upstairs that were a glossy paint, and it was not working for us. Changing to a flat "ceiling white" improved the look tremendously of the 60's swirly texture. This last weekend we made a lot of headway in the basement. It has lots of wonderful painted paneling that is heavy oak, but has the grooves every 8 inches or so. Those really slowed us down because we had to paint them with a brush, not a roller. Did I mention that about a third of the walls downstairs were painted a "Pumpkin Spice"? Honestly, the color didn't bother me, (you all know I love pumpkin anything) but Hubby, was not going for it. Somehow he couldn't envision orange in his office area. So that's been fun trying to cover. That's me with my Magic Brush. Give me a good 1 inch trim brush and I can paint all day. Hubbs calls me a "Brush and Paint Snob". He wanted us to start painting the woodwork, but I emphatically said "NO!" 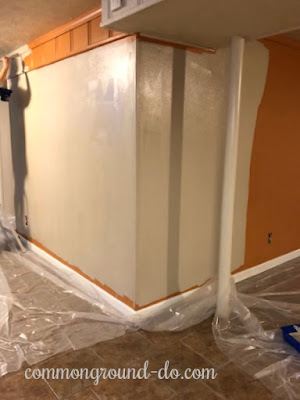 Trim painting is a super big job, at least to do it the right way. I want the woodwork at this house to have a beautiful transformation, and I knew we couldn't do it justice. Besides, I can paint a wall with the best of them... woodwork not so much. We used Benjamin Moore paint-and-primer-in-one over the pumpkin color. It covered in a single coat, but we are going to do 2 coats because of the intense color. I'll have more photos of the mostly finished area later. I'm pretty happy with the color, it's really lightened up the space. Plus new LED flushmount light fixtures to replace the "amber" colored heavy glass globes of the existing fixtures. The basement will have a family TV seating area, but also be my husband's office and "man cave". A place for the guys to hang out. He has some deer mounts in storage, so I've promised him he can use them down here... somewhere. That's the latest for this week. I'm looking forward to seeing the change in the look of the upstairs trim and woodwork when the white (Alabaster White has a slightly gray undertone in the white) from Sherwin Williams is complete. 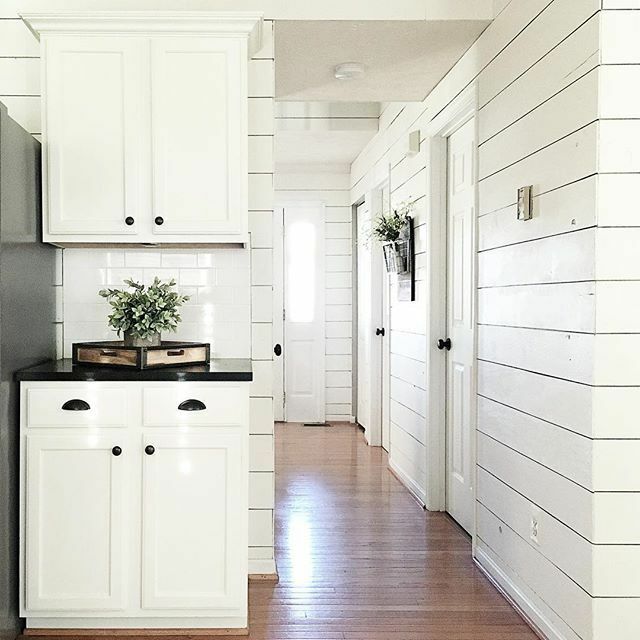 This photo is not our house but found this pic of Alabaster White on Pinterest. Fall Weather is finally here! It's fun seeing the changes you are making! 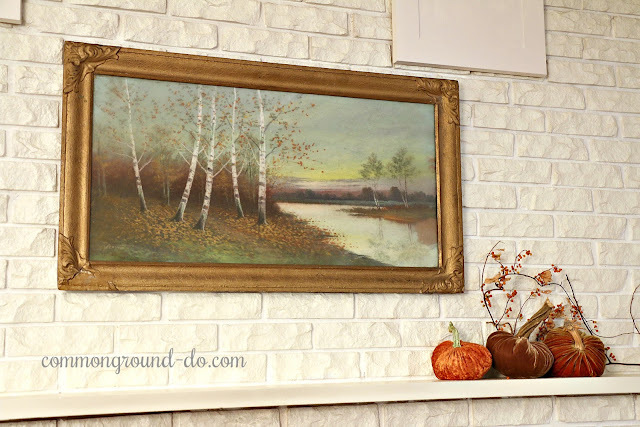 I love the birches print...so lovely with the pumpkins! Progress! And fun, new (old) finds! Apart from the inevitable aches from working everyday, it must feel exciting. I can't wait to see it all unfold, Debra. 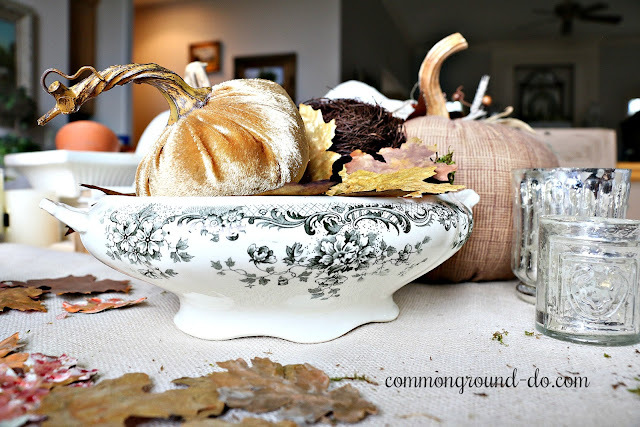 Lovely fall touches! I’m glad you found a place for your painting. It looks perfect over the fireplace. 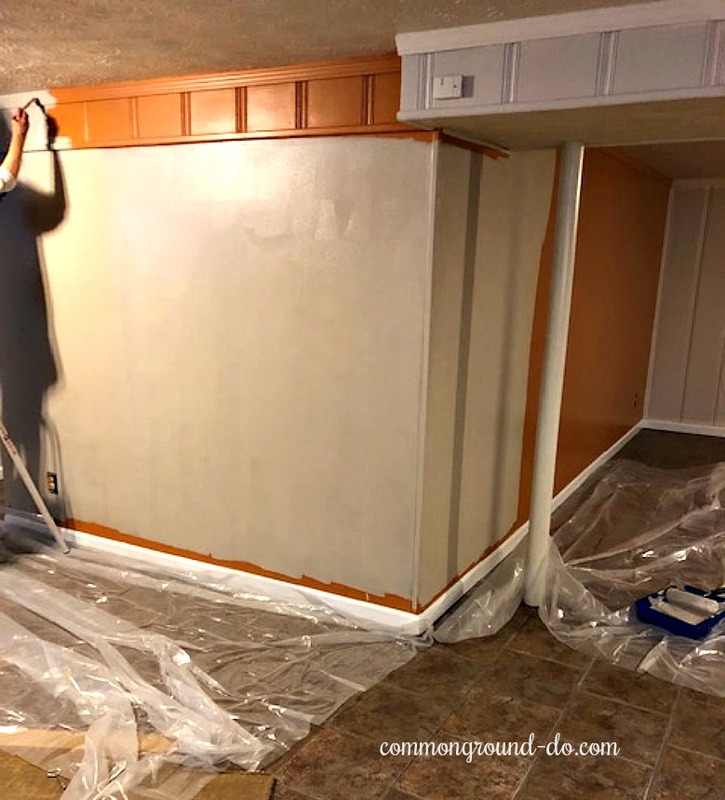 Can’t wait to see how you two finish up your basement! We have our spare bedrooms and J’s man cave in ours. Happy Fall! Oh Debra the new color in the basement looks so great. Yep Pumpkin in a basement probably was not a great choice. Your hard work will pay off. Already looking great. Glad you are finding time to have a little fun with fall decor with just getting moved in.